It’s no secret that the air cargo industry is fraught with invoicing issues. A byproduct of this is the hundreds of auditing firms burdening carriers with overcharge claims. But, invoicing errors are not a one-sided issue. The data we’ve collected while working with major global carriers over the past 12 years shows that invoicing mistakes do not discriminate. 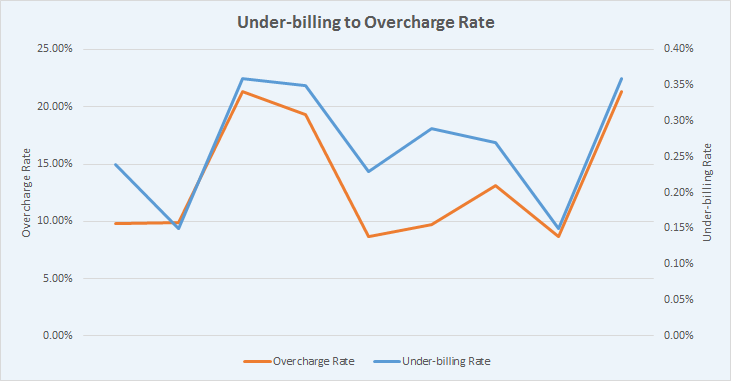 Carriers with a high overcharge rate also have a high under-billing rate, while those with lower under-billing rates have fewer overcharges. Analyzing the data further shows that under-billings on average equate to approximately 2.5% of overcharges. The under-billing to overcharge range is 1.67% to 3.25% — this is a very tight range from our perspective and makes overcharges an extremely good indicator of under-billings. Based on the current over-charge rate and data from CASS that shows that the direct air cargo carrier market topped $26.4 billion in 2016, we believe there is more than $65 million in revenue leakages / under-billings for direct air cargo carriers. The figures are significantly higher when looking at the broader market of direct and indirect carriers. Data research company MarketLine estimated that the 2016 airfreight market, including direct and indirect carriers, topped $101.3 billion. Based on these figures, we estimate direct and indirect carriers are incurring an annual revenue leakage / under-billing amount greater than $250 million per year! While staggering, the numbers above do not account for turnover relating to customer friction and distrust in the carriers’ billing capabilities. One major indirect carrier disclosed how invoicing issues were contributing to high CHURN rates and a decrease in customer satisfaction. This may also be reflected in IATA’s 2015 and 2017 Global Shipper Survey, where Shippers gave carriers a 7 out of 10 scores —not great for an industry based on providing premium service. So, while air cargo revenues continue to climb (more than 12% this year in the U.S. alone) and carrier profits also improve thanks to lower fuel prices and tighter capacity, carriers remain vulnerable. There are still underlying gaps within their billing systems and processes that are resulting in significant revenue leakage. A spike in fuel prices, drop in demand, or a major geopolitical issue would unmask the hidden problem and severely impact the bottom-line. The International Air Cargo Association Executive Summit sees future-proofing the industry as a major concern. For their 2017 theme, the conference focus will be on future-proofing the industry, which is plagued with legacy systems and processes. According to their 2017 Strategy report, the association believes that the air cargo industry continues to face challenges of sustainability, profitability and customer satisfaction. They find that the industry has been slow to adapt to an increasingly electronic world that demands more transparency, speed, and efficiency. Global implementation of the eAWB initiative is barely above 50% to date. Each day millions of air waybill copies are exchanged across the supply chain, increasing the chance of errors, reducing the efficiency of the process and causing customers and partners numerous pain points because of poor service quality. While many believe the industry is far from being immune to global shocks (including IATA), I find that carriers are complacent even though global unrest and volatility throughout the world can jeopardize the air cargo recovery. Now is the time for carriers to improve their flexibility within their systems and processes to adjust to the changing environment. Unfortunately, there’s much room for improvement. According to an Accenture Air Cargo study, only one in four carriers can adjust rates across six or more factors, including market, product, commodity, ULD (unit load device), weight/volume, and market fluctuations. Almost 60% believe that rate calculation inconsistencies are the top contributor to invoice errors, a major source of customer dissatisfaction and revenue leakage. The $250 million that is lost each year due to poor invoicing accuracy could be used to drive innovation, processes and technology that can future-proof the industry that is still using “spreadsheets” in some instances. So, Where Are the “Invoicing” Gaps? 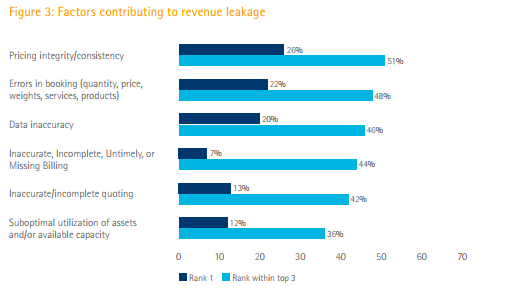 Why Is the Air Cargo Industry Unnecessarily Losing More Than $250M in Revenue Leakages? In many cases, carriers are using TMS systems built by the previous companies they acquired in the 1990’s or early 2000’s. They’re then overlaying these systems with operating, visibility, and billing systems which were not designed to communicate with each other—broken interfaces and data integrity issues are compounding the problem. In addition to not having the right technology, in-house pre-audit teams do not have the tools or bandwidth to identify many under-billing issues. They often “spot check” exceptions kicked out from the auto-rating system. Their legacy systems can’t make use of predictive analytics and ad hoc querying functionality to provide a comprehensive quality control of their invoices. And, there are few 3rd party revenue protection firms that understand the nuances of the air cargo industry. Most are generic auditing firms that don’t have the expertise required to perform a revenue audit. The air cargo industry has many complexities that make it unique, such as commodity-based pricing, numerous container types, and surcharges, and volatile rates that are constantly changing. Without the right technology and shipping knowledge, internal staff and generic auditing firms are going to catch less than 1/10 of the revenue that should be protected. For example, during an RFP one carrier held for evaluating revenue protection vendors, the generic firms that focus 95% of their time on accounts payable audits only identified $50K worth of lost revenue vs. the $1.5 million in under-billings that should have been identified. With another air carrier, they failed to uncover systemic issues, including one that involved 750-1200 military shipments that moved to Dubai but the original invoice mistakenly omitted the cost of feeder service to the off points. This was a $3+ million revenue leakage due to a hidden billing issue. New SaaS Technologies Are Not Fixing The “Invoicing” Issues & Giving the Air Cargo Industry the Revenues They Need to Future-Proof the Industry. Recent Accenture studies show that there has been mixed success with cargo management software. SaaS technologies are providing a high degree of automation in booking and routing processes and an enhanced visibility into capacity utilization, but it’s not enabling them to maximize profitability or maintain price integrity across the entire quote-to-ship cycle. While SaaS technologies and other software solutions may provide some benefits, there’s often a hidden cost few carriers realize. One carrier tried implementing a new cargo revenue management solution, but they experienced a significant uptick in both under-billings and overcharges. It disrupted the customer experience so much that the executive leading the charge for the new tech initiative got fired. No matter the internal factors or issues that may be causing the problem, a sophisticated 3rd party revenue protection service that focuses on “revenue audits” within the air cargo space can quickly identify the issue, protect the revenue and add to the bottom-line. 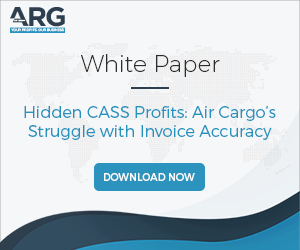 As gaps are brought to the attention of the carrier, process improvements can be implemented that drive up invoice accuracy. For example, our clients which include many industry leaders, have seen under-billing rates typically drop 20% after the first year and overall invoice accuracy rates improve -meaning fewer overcharges and less customer disruption. They are also benefiting from a faster quote to cash process, a reduction in the cash conversion cycle and days sales outstanding as they receive less and fewer invoice disputes and more on-time payments. More importantly, our clients have collectively gained $150 million in combined gross profits and this number will only increase as more direct & indirect air carriers realize the need for revenue protection to reduce churn and enable more profitable growth.